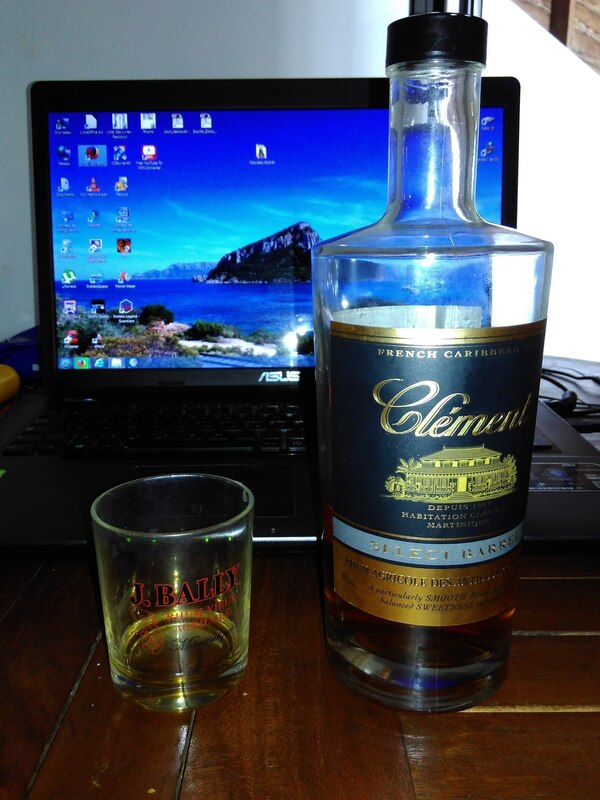 Have you found an online vendor selling Clement Select Barrel? I felt the taste profile on this was kind of like a cross between rum and bourbon. I like it. I feel this truly is a bourbon drinkers rum. Good neat and I can see it being good I some mixed drinks. For better or worse, this rum tastes very similar to a bourbon. I happen not to be a big fan of bourbon, but if you are, you will like this rum. And like a bourbon, its flavor has the potential to overpower drinks. Taste - dry, oaky, slight burn, somewhat grassy, cognac or bourbon taste to it. Ambra.banana, caramel ,fresh fruity,a Little bit bitter and lapposo. Not quite an 8 but definitely better than 6. This is a fine candidate for a standard rum to represent at a soirée. It does display agricole trademarks such as pepper and grass though it's far more neutral than an XO offering. Think Haagen Dazs Rum Raisin. Quintessential rum sugar flavor with a bit of bite. Smooth and creamy bottled at a pedestrian 40%. If your planning an upscale shindig and buying only one rum, consider this. Looking for something substantial, spend a little more, your not far from finer sippers. Different from most rums I've had. Almost a nutty and creamy flavor compared to others that typically are more sweet. Excellent finish. This is where the best rhum agricoles can't compare to the best of the "proper rums"...if you ask me. An interesting bottle; not too young, not too old. Though only slightly aged, it's a perfectly sippable counterpart to sweeter aged rums, and makes a fantastic Ti' Punch. Still, if you're deciding between this and one of Clement's older offerings (and you can spare the extra cash), I'd swing for the latter (or a blanc). Overall, an excellent introduction to rhum agricole that won't leave you disappointed. 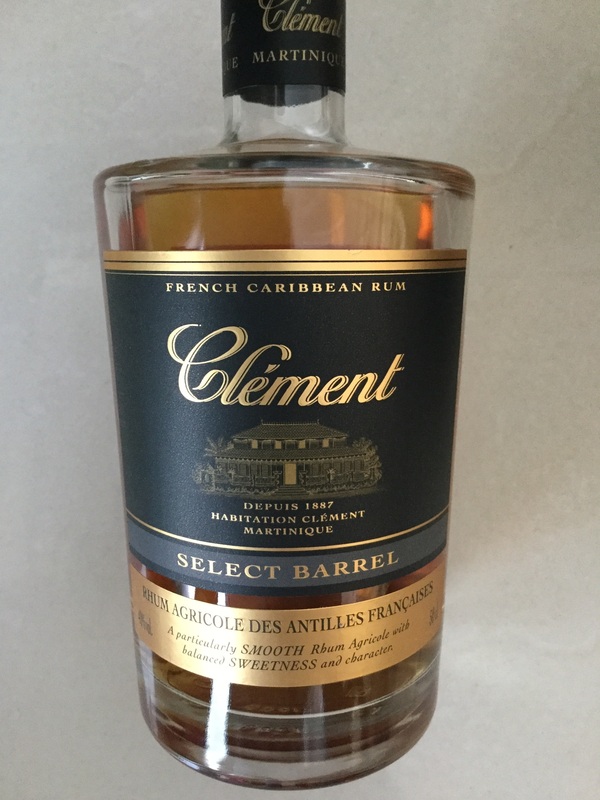 Rhum vieux d'entrée de gamme de chez Clément, ce "select barrel" est un assemblage d'eaux de vie vieillies dans des fûts de chêne neufs. Design : bouteille standard de chez Clément, simple mais efficace, le rhum a une belle couleur vieil or. Nez : riche, sucré, fruité, vanille...très engageant. Attaque : vigoureuse, boisé (très présent), vanille puis notes d'alcool. Finale : boisé, léger goût de canne. On retrouve un côté "bourbon", ce "select barrel" est le pendant du "black sheriff" de chez HSE (distillé au même endroit). I have sampled some of the Clement rums and thus far liked them all. This one, however, is more challenging. It is quite different. It is a blend of single-cane agricole rums then matured for three years in used French oak barrels. It is a rich, deep amber colors with a strong yet pleasant aroma. The flavor pulls no punches. There is an immediate pepperiness with an underlying cane juice sweetness (just a hint) along with definitely oak flavor. It has a real burn to it. This is almost like a young bourbon in a way. It has a dry finish. In some of their other agricole rums a noticeable grassiness is present but in this rum it is barely noticeable until the finish and then you can taste it until it fades away. Hard to consider this a sipping rum. I would prefer it as a mixer but not certain what sort of drink it would do best in. I would hesitate using it in fruit-based cocktails but I wouldn't turn down one made with this rum. Overall, a complex rum for advanced palates. This is definitely not a rum for novices. Smaak: hout, kruiden, zachte karamel en vanille. Heerlijke agricole voor een zacht prijsje. Had at the rum bar, Key West February 2019. Decent. Quite ok balanced but a bit too spicy for my part. I had wanted more sweetness and round flavors. Lighter body for an agricole, very nice to mix with -not just for ti punch! I had my first tastings last night, and it is my first experience with an Agricole, so I may well add more to this review as the weeks pass. Initially it is a fairly nice sipping Rhum, a very smooth feel, not burning at all like someone else mentioned. It is sort of fruity and light, but has this weird taste ....... nearly everyone mentions "grassy", and yes I get that, but there is also a sort of rubbery chemical taste, that although not entirely offensive, is a little off putting, and I would imagine become very sickly if consumed in larger quantities . I am really not sure about it to be honest, but it is very smooth and different. Update... I was not fond of sipping this neat at all, but to my amazement, when I added a mixer to it, it tastes really good, all the citrus fruit flavours burst forth and the grassy weirdness subsides. Thank God I tried it like this or else it would never have been touched again. This was the medium bodied sample in a French tasting I did, and the medium body is at least accurate. Smelled decent enough, but had a bit of a burn on the way down. Not something I would rush back to at least as a sipper. Možná budu za barbara, ale tento rum nejlépe chutná v čaji s medem - zde se naplno rozvine jeho chuť a udělá z nápoje skvělý horký koktejl. Tried the Clement Select Barrel at the Cuba Casa de Mojito in Ho Chi Minh City and the place was for sure not lacking the ambiance, but the Clement Select Barrel was quite a disappointment. In a blind test this is a cheap Bourbon. But I was not in a blind test and man the burn on this rhum is just nasty. There are minimal aged rum flavors on this one. If you like Rhum Agricole's, then add 3 points to the score. If you don't, safely skip this one. Decided to try this agricole, because it was reasonably priced and I liked the look of the bottle. I paid €24 for it. After smelling it, I almost thought I had bought a bottle of peaty whiskey. Tasting it confirmed my suspicions. I have to say it took some getting used to the taste and I'm not a big fan, but I guess my friend who likes whiskey could enjoy this. Petite déception pour ce Clement. Trop de parfum de vieux cuir voire de poussière. I had read great reciews about Clement so I was very excited to find this at my local specialty liquor store. After letting it sit for 30 minutes in a snifter, I took a whiff and honestly couldn't tell this was rum. It smelled more like whiskey/bourbon to me. The taste to me was not much better. There was quite a burn and there was an overwhelming taste of mildew that completely dominated the taste profile for me. It was almost like cork taint, but there's no cork. Just wasn't the best for me, especially for $35. I hope the rest of you have better luck with this one. 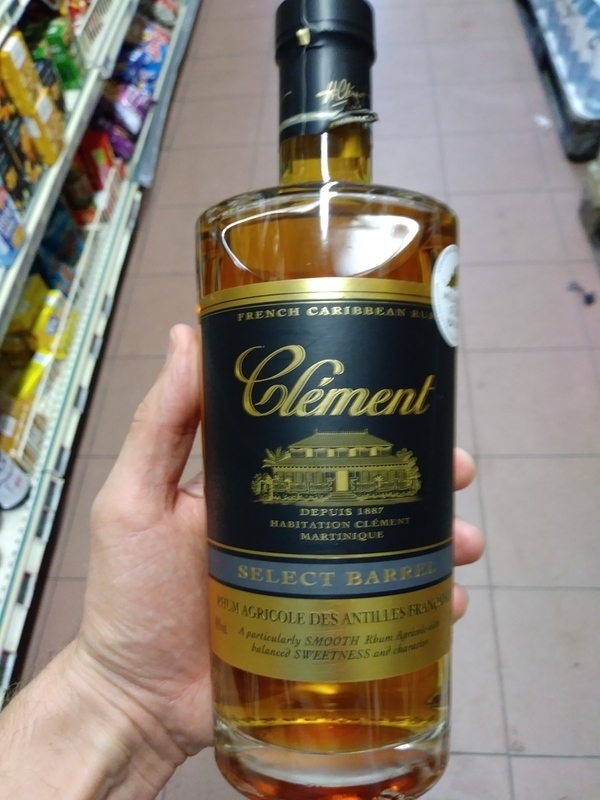 Ce Clément select barrel est un rhum agricole classique. Entrée de gamme chez Clément. Personnellement, je le trouve trop sec. Bonne dégustation! Une douce et agréable sensation envahit le palais. Des notes vanillées viennent enrichir ce rhum qui pourrait avoir été vieilli dans des fûts de bourbon.